If you’ve searched for a healthy nonstick cookware, then you’ve no doubt already heard about Red Copper cookware. Their ads are plastered all over the television and internet, claiming to be the only type of cookware you’ll ever need along with a lifetime guarantee of nonstick cooking for any dish. Is this too good to be true? Is Red Copper really all it’s hyped up to be? This guide will go through the details of Red Copper cookware – what it is and how safe it is. Then we’ll look at some of the most popular options to see which Bulbhead cookware product might be right for you. What Is Red Copper Cookware? Do Red Copper Pans Work? What Is The Red Copper Pan Warranty? How Do You wash Red Copper Dishes? Does Red Copper Cookware Need Seasoning? Do All Red Copper Dishes Have Lids? Can Red Copper Go In The Oven? Red Copper cookware is a type of cookware that uses copper in the pan lining to improve your cooking. Copper is ideal for cookware because it transfers heat evenly, is oven safe, and very strong and durable. The lining is also infused with ceramic to prevent food from sticking to the pan. The names BulbHead and Cathy Mitchell go hand-in-hand with Red Copper cookware. BulbHead is an innovative company that takes unique ideas – like Red Copper – and transforms them into As Seen On TV wonders. Cathy Mitchell, queen of infomercials, has been selling countless different kitchen-related items for over 25 years. 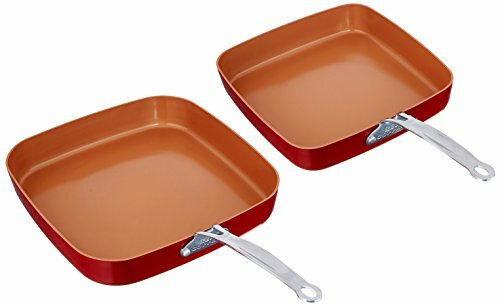 Currently a big endorser of Red Copper pans, she demonstrates how well they caramelize, flambé, fry, and bake with ease, and offer quick and easy cleanup every time. Are they really copper? The name ‘Red Copper cookware’ in this case is a tad misleading. There are normal copper pans on the market, which are made from copper metal and coated in tin or steel to make it food safe. In the case of Red Copper cookware, it’s made from lightweight aluminum, coated with a ceramic lining containing a hint of copper, and painted red. This is brilliant marketing, since advertising as the best copper cookware gives the impression of gourmet chefs and shining copper pots. But these pans are essentially nonstick frying pans made in China from cheaper metals. Many real copper cookware manufacturers scoff at these pots and pans, writing them off as just another silly trend that will fizzle out as people use and abandon them. See our Gotham Steel pan reviews for a look at a similar line of titanium copper cookware. Professional chefs know that real copper can be deadly, leaching into food if not coated properly. The FDA warns against using unlined copper. Those concerns can be laid aside as this isn’t real copper, it is considered more of a nonstick cookware. Is ceramic cookware safe? We think so. 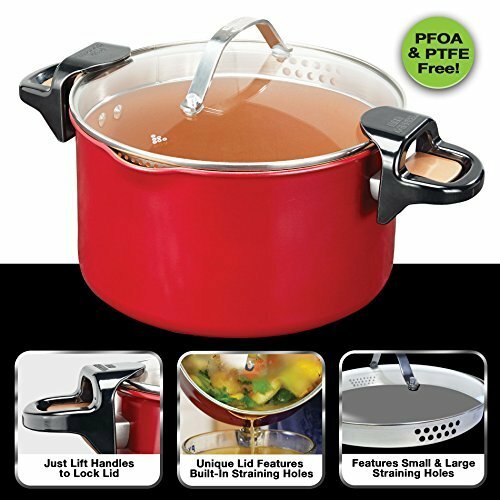 Red Copper cookware is PFOA and PTFE free, so most health concerns are allayed. Also, the amount of real copper used is negligible, so copper poisoning is off the menu. If used correctly, Red Copper cookware shouldn’t present any health concerns for your or your family. Just be sure to follow the manufacturer’s instructions about utensil use, dishwashing, and oven use, to keep the nonstick lining intact. Cathy Mitchell’s favorite pans claim to be the ultimate in nonstick cookware. They promise to never scratch, chip or stick. To achieve that, you must only use wooden or nylon utensils, hand wash, and season or cure per the instructions. Includes 8-inch fry pan, covered 10-inch fry pan, 1.5-quart covered saucepan, 2.5-quart covered saucepan, steamer insert for 2.5-quart pan, 6-quart pot with lid. For a short time, they will serve you well without much seasoning. Pancakes and eggs are easy to cook and slide right off the pan. The bad news is that seasoning is the only way to keep this cookware truly nonstick, but it’s not that difficult. However, this process must be repeated often or your pans will become sticky and messy. Also, while they claim to be dishwasher safe, the dishwasher seems to erode the nonstick coating. It also reportedly chips the red paint on the outside. This paint has been known to come off on people’s stovetops when used over high heat. The Red Copper cookware set is well-thought-out, with a very good array of pieces. It’s handy that they’ve included larger skillets and pots to cater to every household size. However, buying them is a gamble, as they may not hold up to heavy cooking. This non-stick pan is good for use on the stovetop or in the oven. The small surface area is nonstick, non-scratch and free from toxins. It heats evenly and quickly and cleans easily. If you do put it in the dishwasher, you could damage the coating over time. Same goes for using any utensils that scratch. This detracts from the ease of use claims paraded around in the commercials. While the Red Copper pan does work well for many projects, like pancakes, eggs, and small stir-fries, it doesn’t work well for very long unless seasoned as mentioned in our previous review. For that reason, we think this may only be a wise choice for someone who is used to nonstick cookware and won’t be using it daily. The unique square shape of this pan offers more cooking surface and extra room to use utensils versus a round pan. The aluminum rings on the bottom make it ready to cook evenly on a burner, and can be used on an induction cooktop. Like the regular pans, these heat evenly and quickly. The two pan sizes can tackle any meal, and the 2-inch depth is great for big dishes or even pizzas. As with the rest of the line, after a time they begin to burn and stick. Even with seasoning and tender care, they don’t last and the quality is low. Inconveniently, they don’t include lids. A good place for a novice cook to start, but not worthy of a true chef. A fun twist on the Red Copper cookware, this is an electric cooking unit, similar to an electric frying pan. You can watch Cathy Mitchell’s fun commercial to get an idea of the possibilities – fluffy omelets, crisp hash browns, seared steaks, and even lava cakes. All of them cook in just a few minutes and are supposed to slide right out with no mess. The nonstick coating on this seems to work better than the coating on the traditional pans, but it’s not without its faults. For starters, they don’t mention that you must flip the unit over halfway during cooking. Also, if a rising dish like a cake or omelets is made, you must leave the unit unlatched. Otherwise it will build up steam and your food may explode everywhere. Like the other Red Copper products, the quality is subpar. This unit will begin to break down after some use. The paint chips, the latches break and the food sticks. The unit is also deceptively tiny, making it hard to cook an omelet with more than two medium eggs added. 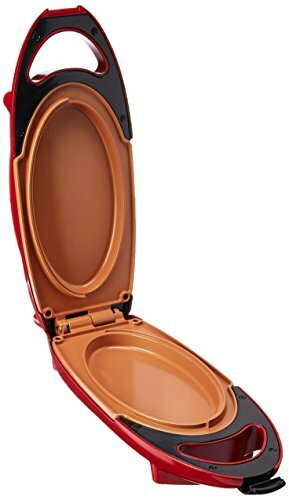 The size makes this ideal for someone living on their own and needing fast meals, like a college student. For families of more than two, you’ll be cooking all day using this tiny machine. This is a unique pot that is dedicated to pasta dishes. Having a nonstick interior makes one-dish meals easy, as you can boil and dress noodles in one dish without a sticky mess. Being PFOA and PTFE free means no chemicals will leach into your food. The locking handles hold the draining lid securely in place, so no need for extra dishes like colanders. The two differently sized drain holes are convenient for draining any type of pasta, and acting as a steam vent to prevent boil overs. Although you don’t need a colander, you do need extra time. It takes a while to drain the water out of the small holes and requires a lot of arm strength. You’ll see the lack of quality when it comes to the handles, which often break or refuse to lock. The outer red paint chips off and the bottom easily gets burn marks. Great for making the occasional pasta dish or draining fat without creating extra washing up. Not a high-quality stock pot for an experienced chef. Red Copper pans have good nonstick surfaces. After a while, or if used improperly, the pans will start to stick and won’t work. Red Copper offers a lifetime replacement guarantee. This only covers a manufacturer defect with normal use. Since you have to pay shipping and handling to send the cookware back, you may end up paying more to replace it than you spent on it in the first place. This can be confusing. The commercials tout the wipe clean with a cloth aspect. But that doesn’t always work. You can technically put these in the dishwasher, but the instructions that come with the cookware say that handwashing is best. In the end, only dish wash if you aren’t concerned about wearing away the nonstick coating. Seasoning is not required, but it is recommended. It will help your surface stay truly nonstick. You can follow the manufacturer’s instructions on seasoning or curing with oil. If you buy the 10-piece set, you’ll get lids that go on the saucepans as well as the 10-inch frying pan. Otherwise, you have to order the 10-inch or 12-inch lid for the frying pans. The only way to get a lid for the square frying pans is to buy the entire Red Copper 5-piece square set. All Red Copper cookware is oven safe up to 500 degrees. That means that most high broiler settings (550 degrees) are too hot, but a low broiler or normal bake setting should be fine. The Red Copper craze is easy to understand – people want the professional look and durability of copper, with the nonstick glaze of ceramic. 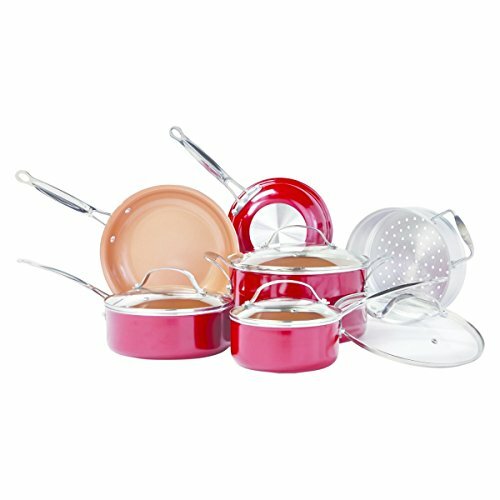 The prime pick in the range is the Red Copper Square Dance Pan Set. The square design gives extra space for flipping pancakes, eggs, and sandwiches. It also makes some delicious and fun square pizzas and monkey breads. Hello. Thank you for this review. 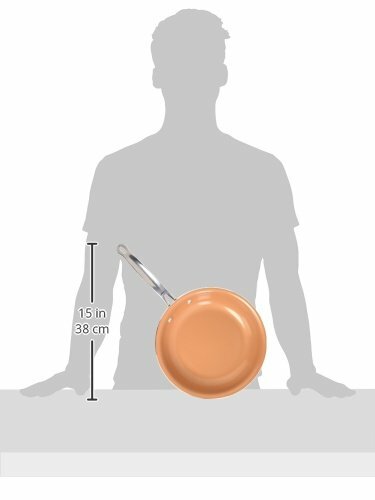 I just received the Bulbhead Red Copper Square Pan 5-Piece Set for my birthday, and I was trying to figure out if it is safe. From your review, it appears that the copper should not be an issue. Do you think it is likely the aluminum core would leach into the food? I realize the aluminum isn’t touching the food, but is it possible to leach aluminum through the heating process? Since I have two sons on the autism spectrum, I try to understand these things as much as possible. Thank you for your help! Great questions! Personally, I think anything is possible. They may be fine under normal conditions, but what if you heated them too much one time or there are some manufacturing issues that you couldn’t detect? You might be better off purchasing cookware that doesn’t contain aluminum just for the peace of mind. There are some 100% ceramic cookware sets by other brands like Xtrema, but they are a bit pricey and may not be as easy to work with. Because your situation is so sensitive, I would contact Bulbhead directly as they may have had similar queries to yours and could give you more details about their products.